It’s a little ironic that I first made this dish the day after my friend offered to donate her tagine to me. She had fallen out of love with it and no longer used it and was happy to pass it along. I had just finished my own month long declutter fest playing the Minimalism Game and although I don’t intend on minimising my kitchen equipment any time soon, I’m definitely not in the market for acquiring any extras. 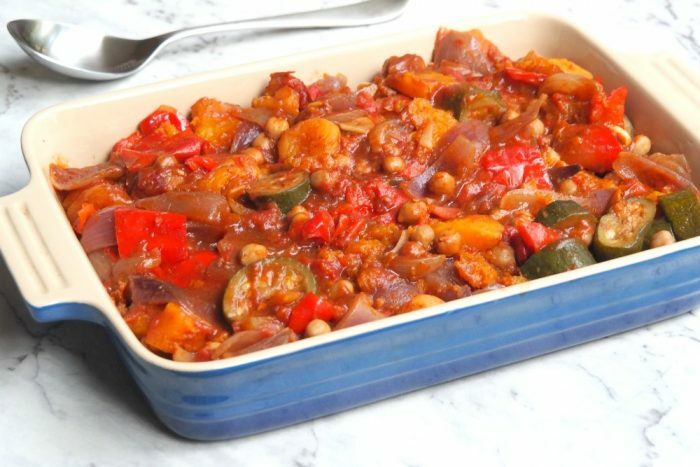 Lucky for me, and for you, you don’t need a tagine at all to make this vegetarian delight, all you need is a slow cooker and if you don’t have a slow cooker, you can find the stove top method here. 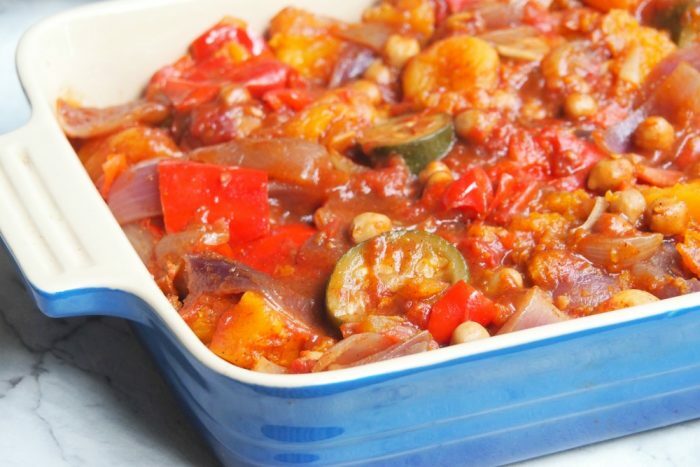 In this dish the “tagine” refers to the moorish flavour and not the utensil in which it is cooked. I first made this to take for lunch to the Asylum Seekers Resource Centre. I was juggling so many balls in the air what with errands to run, appointments to go to, cakes to bake and studying to be done, that I was looking for something that I could just dump and go. Plus, I got to use all my leftover veggies in the fridge because this recipe is super versatile, just use whatever veg you have to hand. 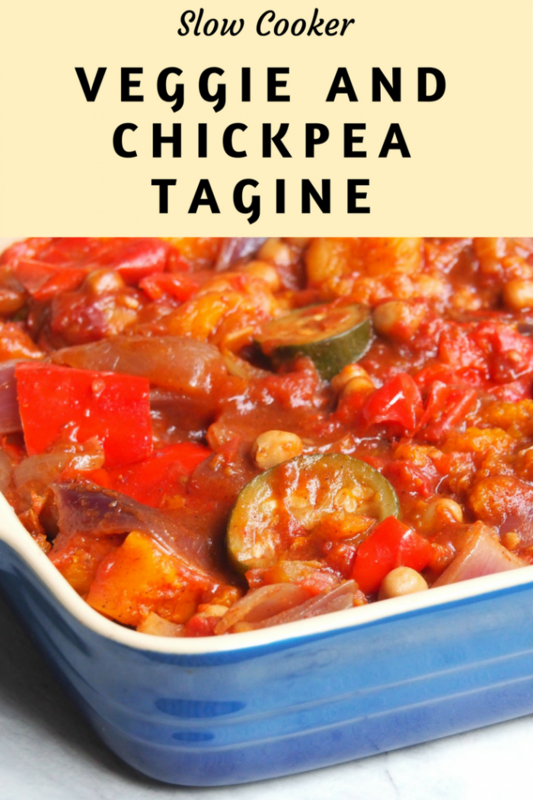 I like to add the chickpeas because not they bring some extra protein to the party. I wish I’d discovered this recipe when I was on the low iodine diet, because this dish is full of yum and more importantly full of low iodine foods. Fist bump! Slow cooker sauces can be a little on the sloppy side, and this one is no exception, I like to thicken the sauce on the stove at the end of cooking, it takes a couple of minutes but it’s totally worth it. 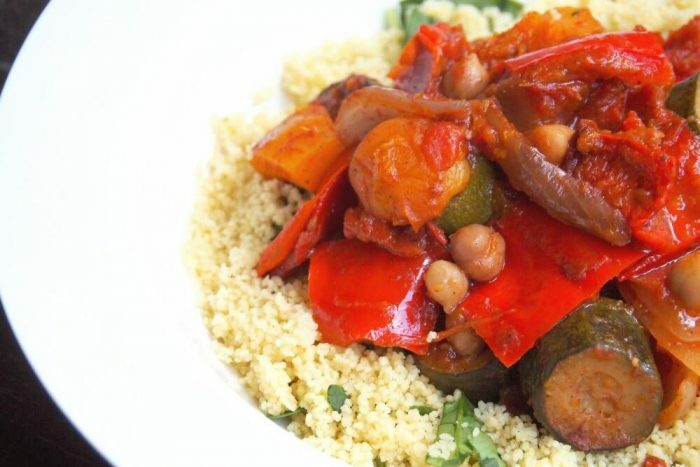 If you want some extra value added veggies with this dish, simply serve it with some spinach couscous. It’s green, but not mean! This recipe is so easy it’s ridiculous. Just drop everything in the slow cooker in the morning and in the evening, you’ll have a delicious dinner ready and waiting for you. Serve with some couscous or crusty bread and you’re good to go! 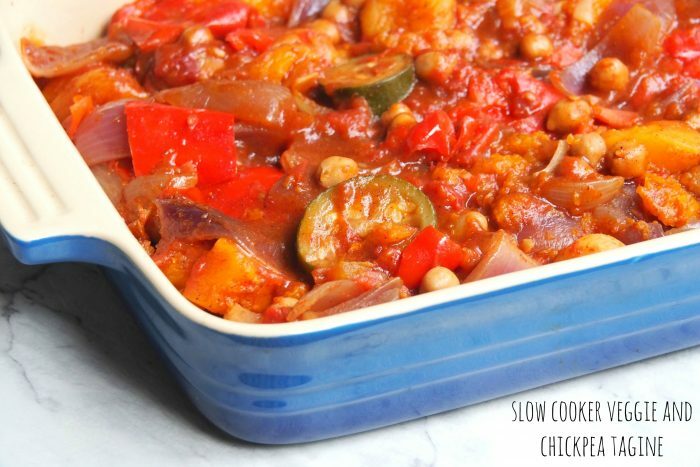 Simply mix all the ingredients in the slow cooker and cook on LOW for 6-8 hours until all the veg is tender. Season and serve with spinach couscous or crusty bread. TIP! The vegetables release all their juices during cooking. If you prefer a thicker sauce, simply remove the vegetables from the slow cooker, transfer the juices to a pan and bring to a simmer. Mix 1 tablespoon water with 1 tablespoon cornflour, making sure the paste is smooth and lump free. Stir the slurry into the pan of veggie juices and cook and stir over medium heat until the sauce has thickened and is bubbling. Cook and stir for one or two minutes more for the cornstarch to completely through. Pour the thickened sauce over the vegetables.